Do you know your common allergies? One of the most common chronic illnesses throughout the world is allergies. 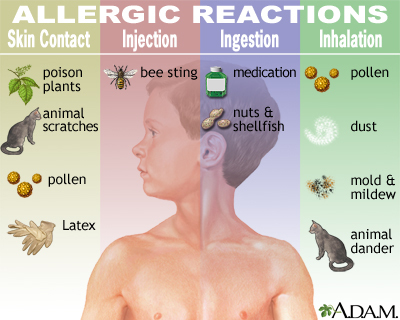 When an allergic reaction occurs, the symptoms typically concern the nose, lungs, throat, sinuses, ears, lining of the stomach, or skin. These allergic reactions begin when a substance that is ordinarily considered not harmful is mistaken by your body as something dangerous. Those substances are called allergens. The five most common allergens (leading to common allergies) are weeds, mold, dust mites, grass, and pollen. Ragweed is a type of pollen that causes sneezing, runny or stuffy nose, and itchy throat. There are 17 species of Ragweed that is able to grow in most regions, which produces pollen. Although pollen is known for affecting people in the warmer months, ragweed reaches its highest levels in September, but then can continue further on into October and even November. Ragweed can then move on to cause hay fever to those that are allergic, which affects close to 23 million Americans. Mold can grow practically anywhere. It mainly strives in areas that are dark, moist, and warm. People with mold allergies will be affected by the mold when its particles become airborne. Because it is a common allergy found in homes, there are many ways in order to prevent the mold from growing. The easiest of these is to have dehumidifiers or exhaust fans, so that it is not as moist and therefore, stunts the growth of the mold. Another way is to just make sure things around the home stay clean (don’t let any spills or leaks hang around for long periods of time, clean garbage cans regularly, clear your gutter, etc). Dust mites are one of the most common allergies that affects people year round. Dust mites are similar-looking to spiders, but they are so small that they can only be seen by looking at them under a microscope. These tiny creatures have a big impact on people whether the bugs are dead or alive. Most dust mites die in conditions of low humidity or extreme temperatures, but even when they die, their bodies and waste stay behind to still cause allergic reactions. There are hundreds of types of grasses that let off pollen that cause allergy symptoms. This pollen can affect many people everywhere because even is there isn’t grass directly near you, it travels easily. The levels of this type of pollen spike on dry, windy days, as oppose to when it is cold or damp.